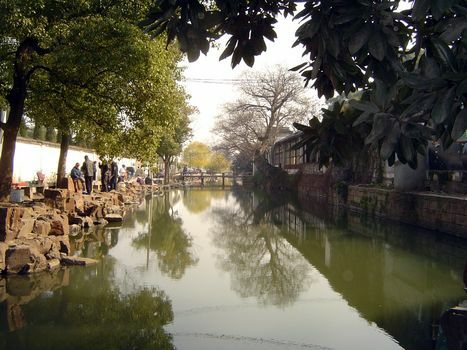 "Present-day Suzhou gives the impression of having changed little." So says A Guide to Nanjing, Suzhou & Wuxi," from 1981. Don't count on it. 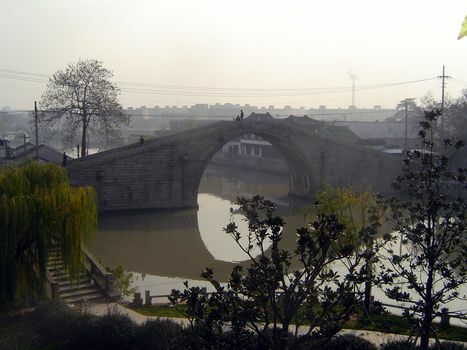 The city is making an effort to hang onto its history, but it is also a booming industrial center, almost a satellite now of that rude upstart, Shanghai, whose own spectacular growth began with the same traumatic event--the Taiping Rebellion of the early 1850s--that devastated Suzhou. 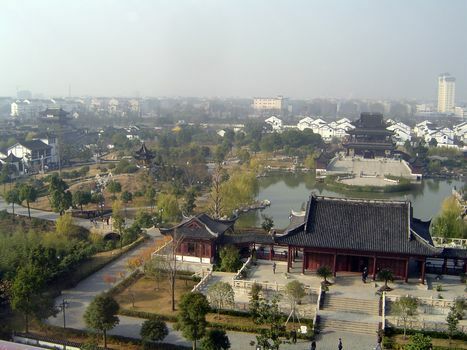 Suzhou is supposed to have been founded in 514 B.C. 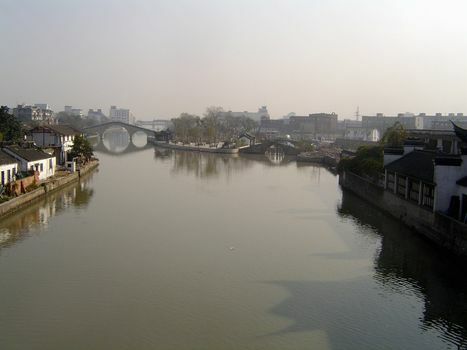 as the capital of the state of Wu, but it only became a city of national importance in the 10th century, when a rice/wheat cropping system emerged here and made the Yangtze Delta the most densely populated part of China. All the region's arable land was in cultivation by 1200, and by 1400 the land was being irrigated with 20th-century intensity. 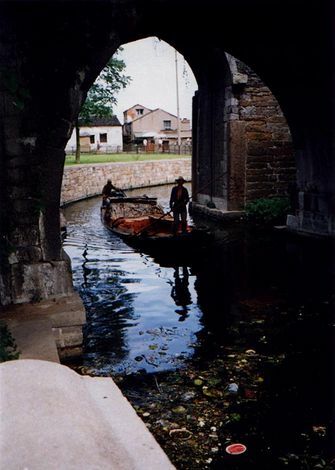 By the 16th century the Grand Canal was sending grain north to Beijing. 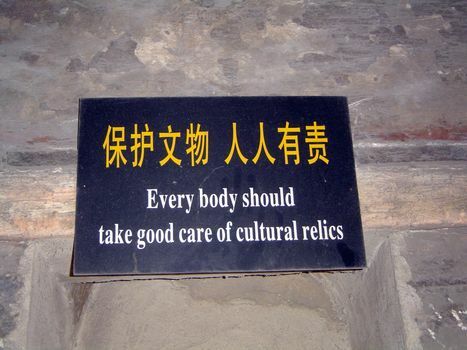 (For more on this, see "Sustainable Traditional Agriculture in the Tai Lake Region of China," by E.C. Ellis and S.M. Wang, in Agriculture, Ecosystems and Environment,1997, p. 61). Wumen. 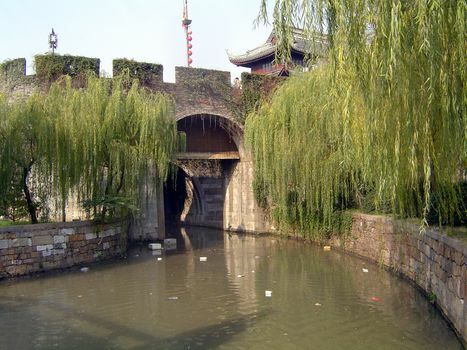 The moat here sends off a branch to the left, where it flows through a water gate in the city wall. The city is fifty miles from the ocean but only 15 feet above it, and there are lakes on all sides, the biggest being Tai Lake to the city's west. From Wumen and looking to the crude (and ever more crudely blocked) bridge over the entrance to Pan Men--Coiled Gate--whose arch can be made out. 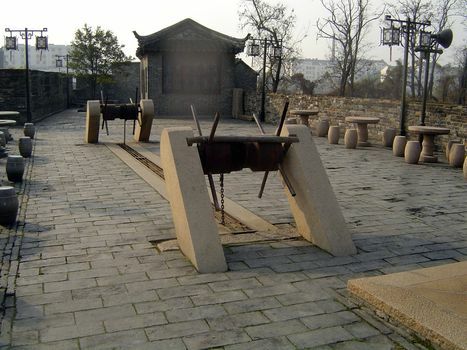 This gate is one of the six shown on the Pingjiang Stele, a stone map of Suzhou (then called Pingjiang) from 1229 A.D. On it are two gates on the west (Chang and Shu), two on the east (Loo and Feng), one on the north (Qi), and this one on the south. Of these six, only Pan Men still exists as a water gate; the others have been reduced to road entrances. Before the 9th century, there was probably another gate on the north and another on the south. A clearer view of the entrance to the water gate. Despite the flotsam, it's now in a protected zone. Above the gate, this windlass, reconstructed in the 1980s, once could block passage through the water gate. 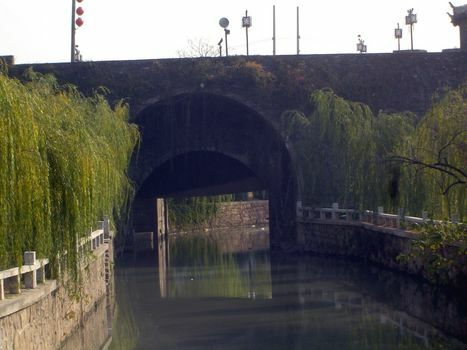 A view of the other side of the gate and the canal that leads into the city's internal lattice work of canals. Ten years ago, before the scenic-area designation put a kabosh on things, Wumen was crowded, and a procession of boats poured through Pan Men. This picture, and the following one, was taken in 1991. A load of bricks, driven by a noisy outboard motor. 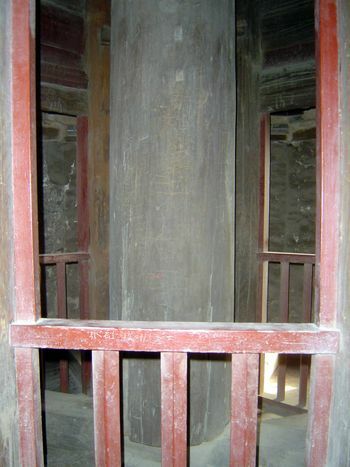 Inside the gate, the Ruiguang Ta, or Auspicious Light Pagoda, originally from the 3rd century but rebuilt in 937 and 1125, when the structure was reduced from 13 to 7 stories. 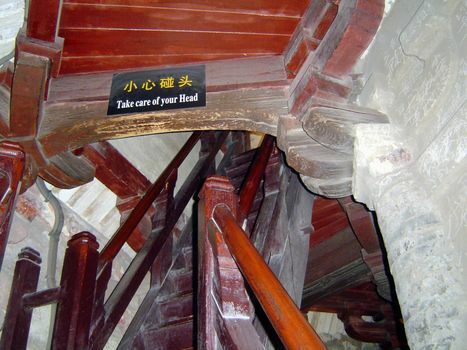 Inside, there's a spiral staircase. In 1978, gilt bronze stupas and other relics were found behind a brick wall in the pagoda. This is the view directly west from the top. 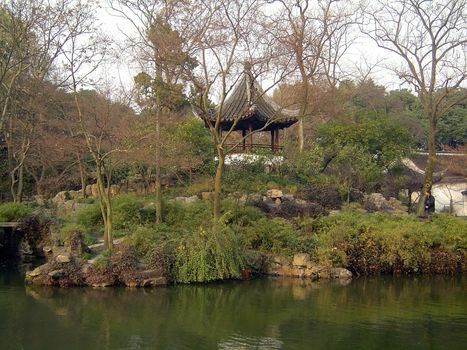 The classically Chinese axial organization of the temple grounds forms a striking contrast with the gardens for which Suzhou is famous. The highrise in the distance, outside the line of the city wall, is a hotel. A view southwest, with Pan Men in the left middle distance. 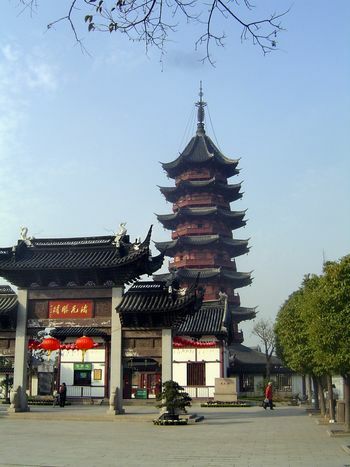 The "pagoda" is the lobby of the Suzhou Sheraton, a joint venture between Singapore's Somerset International and local Chinese who had their hands on a choice parcel. 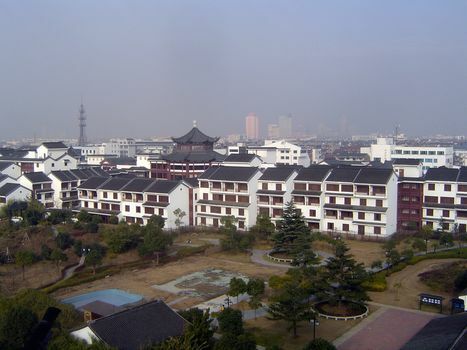 (The hotel's competitors are outside the perimeter of the city wall.) In the distance you can see some of the northwestern suburbs. 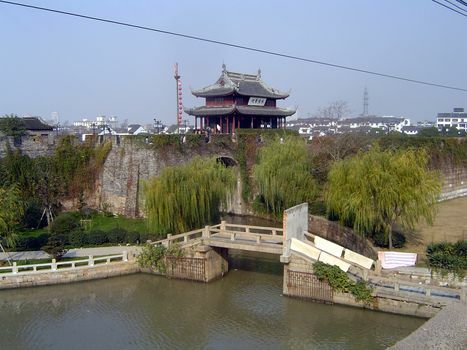 Altogether, the built-up area of Suzhou is at least six times the area--14 square kilometers--within the perimeter of the city wall. 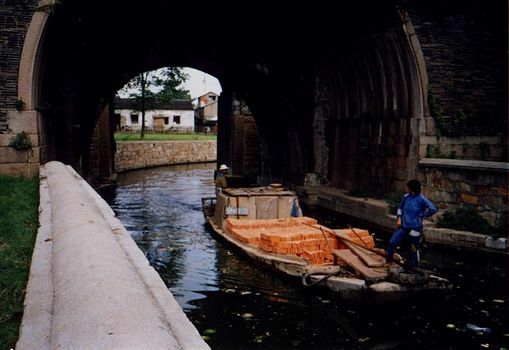 There aren't many--or perhaps any--working boats on Suzhou's canals today, which serve mostly a touristic purpose--here on the approach to one of the city's most famous gardens, Cand Lang Ting, or Blue Waves Pavilion. The garden was destroyed during the Taiping Rebellion and rebuilt in 1927. 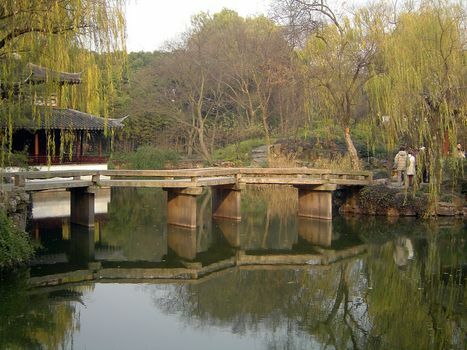 (It may well have been rebuilt after that, too: the Cultural Revolution destroyed most of Suzhou's gardens.) Don't imagine, in other words, that it looks now as it looked centuries ago. Don't waste your time looking for flowers or lawns, either--they're absent from Chinese gardens, which it why it's been aptly said that the Chinese build gardens, instead of planting them. The entrance is rarely through a rectangular gate. Squares symbolize the earth, after all, and a garden is more appropriately entered through a form like the circle, symbolizing heaven. 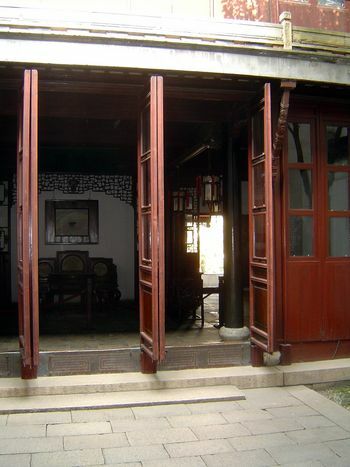 Besides, the "moon" doors encourage single-file entrance, emphasizing the act of each visitor entering the garden. 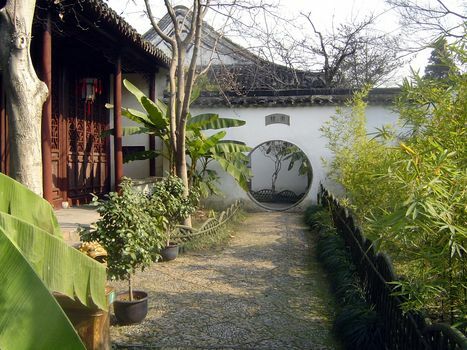 All the gardens have buildings where the owners could sit peacefully and read, write, or talk. 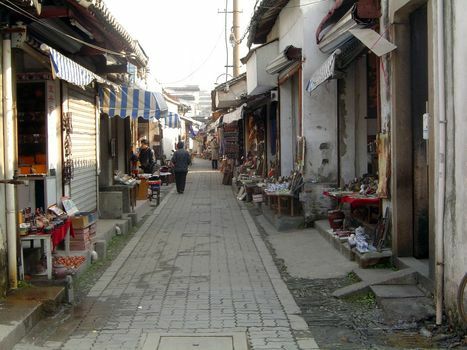 The shop-lined approach to Wang Shi Yuan, the Garden of the Master of Fishing Nets. It's a small place, built in 1440 but rebuilt in 1770 and again in the 1940s. It's a maze of courtyards, pavilions, and varying contrasts between dynamic rocks and peaceful water. 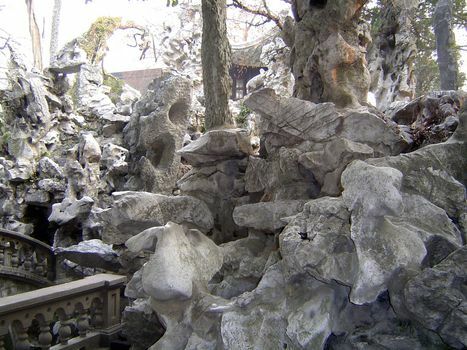 Shi Zi Lin, or Lion Grove Garden was originally built in 1336 by Tianru, a Buddhist monk. 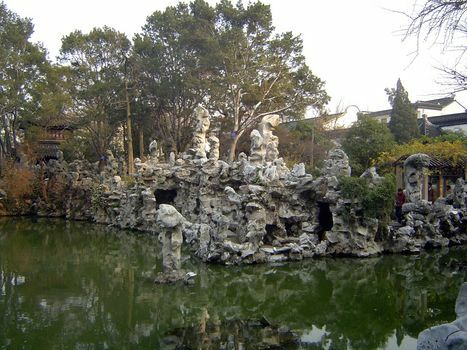 The present rockery is Suzhou's biggest but has little in common with the garden's original lines, subdued in contrast to this stone riot. Rock and pond juxtaposed; Lion Grove Garden. 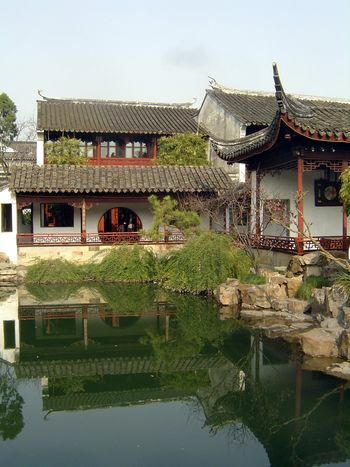 About 5,000,000 Chinese come annually to Suzhou's gardens, along with half a million foreigners--chiefly Japanese. 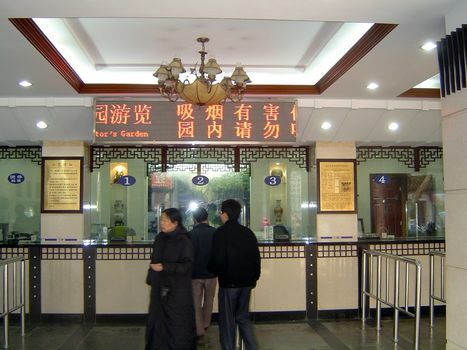 Here, the subway-like ticket office to the large Garden of the Humble Administrator, alias Unsuccessful Politician, alias Artless Administrator. 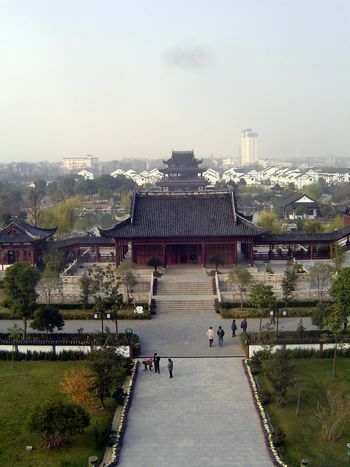 The garden was rebuilt during the Ming Dynasty but since then has been repeatedly ruined and rebuilt. The zigzag bridge is functional, not esthetic: evil spirits travel only in straight lines. It's handy information: safe from attack, you can rest on in island in the lake.